1/14 John Seal The grimmest G-rated film of all time? 3/12 Les Winan Funny, exciting and heart-warming. Everything you'd expect from Pixar and the franchise. 15/190 Max Braden I was pleased that this exceeded my expectations, but I do still like the first movie of the series best. Barbie/Ken was probably the most fun part of the movie. 18/123 David Mumpower A great and fitting ending to the trilogy isn't enough for me to overlook that this is all ground the series has covered before. It should be no surprise to frequent readers of this site that Toy Story 3 finishes strongly in our most anticipated films of the summer. Hell, we've even been accused of being in Pixar's pocket, but we get no incentive, financial or otherwise, for being fans of the animation studio. Our only reward is the pleasure of watching a well-crafted, beautifully animated film with relatable characters each time Pixar releases a film into theaters. Of course, the movie that started it all was Toy Story, and over a decade ago, we were wondering if a sequel could possibly live up to the wonder and glory that we discovered in the first film. As we all know, the answer was a resounding "yes." 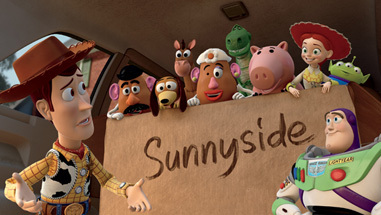 Toy Story 2 is one of those rarified sequels that exceeds the original in terms of quality, story and characters. Pixar would not follow the Disney trend of releasing crappy direct-to-video adaptations of classics. Whether the movie is brand new or a sequel to a previous film, the people running the studio always understand that the story is the thing, which has resulted in such fabulous films as Up, WALL-E, Ratatouille and The Incredibles. With such careful consideration for each film they produce, we're hopeful that we can count on more of the same from Pixar when it comes to Toy Story 3. Having followed the production of the film thanks to Lee Unkrich's detailing the process over the months on his Twitter account, my gut tells me that the amount of love and care that has been put into the making of Toy Story 3 is almost immeasurable. The third film in the series takes the next logical progression that was even foreshadowed in the earlier movies - what happens to a person's beloved toys after they grow up and leave their childhood home? See the latest developments for this project on the Toy Story 3 Movie News page.